arms soaring through the water one last time to get a hand on the wall and win his seventh gold medal of the Beijing Games. Phelps beat Milorad Cavic of Serbia in the 100-meter butterfly by a hundredth of a second, setting an Olympic record in 50.58 seconds but snapping his streak of setting world records in each of his previous six gold-medal performances. 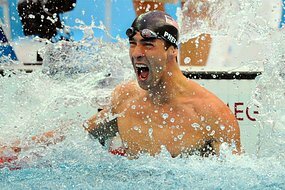 The 23-year-old American has now pulled even with the greatest of Olympic records, matching Mark Spitz’s seven gold medals from the 1972 Munich Games. BEIJING (Reuters) — Serbia lodged a protest over the result of the men’s 100 meters butterfly final after Milorad Cavic was beaten by 0.01 seconds by American Michael Phelps. “We have made an official protest. It’s first place, it is very important,” Serbia’s deputy chef de mission Branislav Jevtic told Reuters. All for that 700g of gold. Serbia’s protest is obviously not surprising. They all wanted the gold. From what I heard on CBC Television, a protest cannot use video replays. That surprised me a bit. What are those officials going to do? Check the wiring of the sensors? Call up the manufacture to find out the reaction time? Interview those officials in blue jackets? IOC said they will soon call a press conference. “Soon”, sounds like they are not going to do anything about it. Michael Phelps is now still on track for the 8 medal legacy. I’m sure many of us wants to see that happen–it sure will be exciting.